This set includes bridge sections that can be assembled in a variety of ways, giving you lots of options for building bridges of any length. 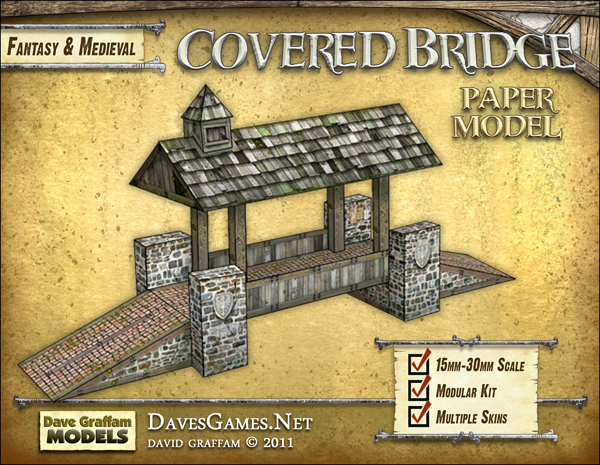 This set includes 10 pages of components, including everything needed to construct several different kinds of covered (or uncovered) medieval bridges. These bridges have a variable footprint depending on the components you choose. The bridge is 2" wide and may cross a gap of 4", 6" or 8". The overall bridge dimensions may be up to 16" long by 3" wide. 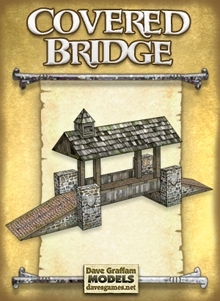 When fitted with a roof and roost, the bridge stands 5.75" tall at the highest point.